A heroic act caught on video. 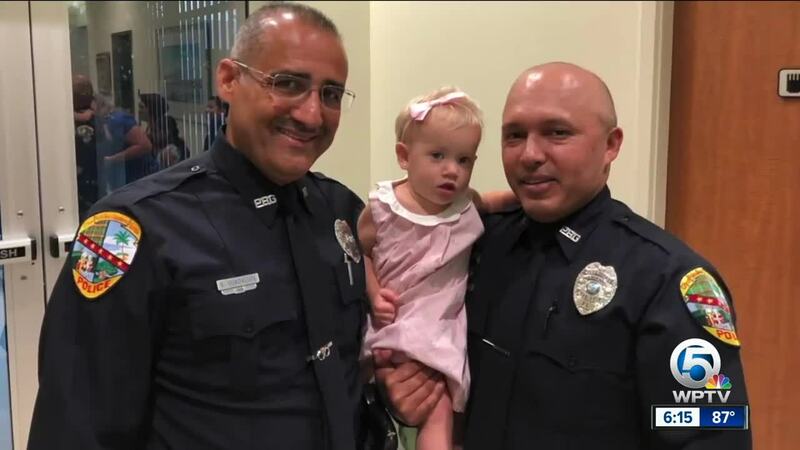 A baby nearly choked to death at Palm Beach Gardens mall but quick-thinking officers who just happened to be nearby stepped up to save her life. The incident unfolded nearly two weeks ago. One-year old Lucia Graham was rescued by two Palm Beach Gardens officers who happened to be eating lunch nearby when she started choking. On Friday, we're got the first glimpse of the heart-wrenching video of that rescue. "They were there for a reason and that reason was to save her life," said Ana Jaramillo de Graham, Lucia's mother. 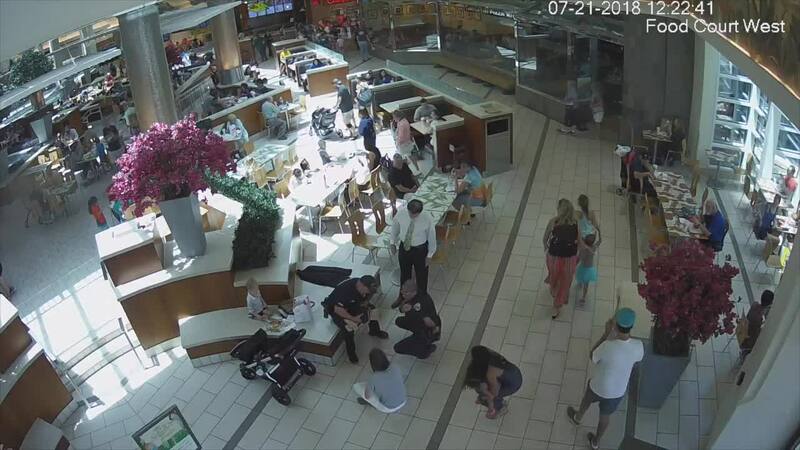 In the surveillance video, you can see Ana with her two kids, including Lucia's toddler brother, enjoying Kid's Day at Palm Beach Gardens Mall. "We got hungry, and like we always do, we went to Chik-Fil A," said Ana. You then notice the moment baby Lucia starts choking on a chicken nugget. "She looked at me with her eyes wide open. She tried to do something with her mouth -- she couldn't cough, couldn't do anything," said Ana. Ana tried a technique taught to her by her pediatrician, which involved sharp blows to the baby's back to dislodge the object. Ana said in a panic, she must not have been performing the technique hard enough, so she started screaming for help. Officer Robert Ayala and Officer Rafael Guadelupe rushed over right away. "Officer Ayala stepped in, I handed her to him. He sat down and so quickly started performing what he needed to do to make sure she was OK. And I sat on the floor panicked. I just wanted to make sure she was OK," said Ana. Finally, the chicken was removed and Lucia was able to breathe again. "They're our heroes. They are the best, best angels we couldn't had that day at the mall," said Ana. Lucia was immediately checked by EMT staff at the mall. Despite the close call, baby Lucia is 100 percent healthy. "They knew exactly what to do to save her life. So, thank you so much officers -- because if it wasn't for you guys, we probably, definitely wouldn't be here with our Lucia," said Ana. Ana recommends all parents take classes so they can properly administer CPR or life saving techniques to children if they are choking. On Thursday night, those officers were honored by PBG city council and Lucia's mom and dad.